Housing Minister Mark Prisk paid a visit to the South East's Mitford Fields development in Reading to announce a major Government investment in the region's infrastructure. Wokingham Borough Council secured funding of almost £25 million for the Shinfield Eastern Relief Road, a vital part of their plans for development in the area, which will see 2,400 homes built by 2026. 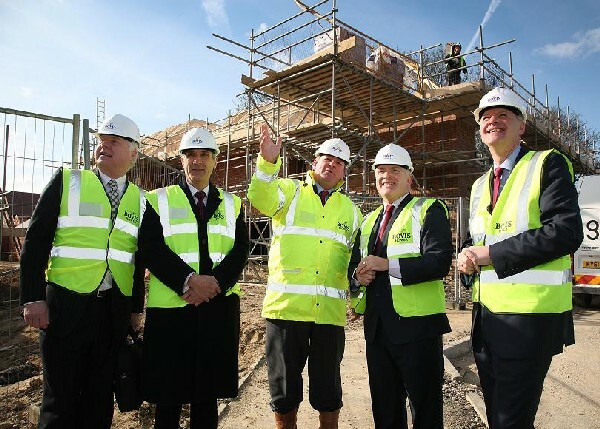 Bovis Homes Group Development Director Michael Black took Mr Prisk, local MP John Redwood and council and Reading University representatives on a short tour of the site. Michael said: "Mitford Fields has been taking shape over the last year and we have worked closely with Wokingham Borough Council and other organisations to ensure that suitable infrastructure is in place for a new development of this size. "The Relief Road will be an important part of this vision for the area and it not only represents good news for existing residents and potential homebuyers but should also create jobs and provide a boost to the local economy. "We now look forward to continuing our work at Mitford Fields as it becomes an attractive new part of this thriving community."